Ever wanted to discover areas outside of your known lands? Perhaps develop trade routes and seek out hidden treasures? Maybe you have always wanted to find interesting new characters to interact with and cajole into working for you? Yeah, me either, but I played Neo Atlas 1469 anyway and the following is what I got myself into. When starting for the first time you are going to be playing for at least an hour before you can save, so be prepared for that. The tutorial at the beginning, which holds your hand every step of the way by having you do rather mundane things that set up the story, is a necessary evil because there is actually quite a bit to learn. It also places a time limit on you to get the game started up, but that doesn’t seem to be an issue, although this might not be the best one to play on the go. I think they just want you to be ready by 1469 so that the game doesn’t get all weird. Maybe it blows up. I should have tried it. When I boot a game up for the first time, I always like to set the controller down until prompted to press a button because I want to see any intro scenes or whatever may come. If nothing else, just to see all that has gone into a title. I liken it to reading the prologue to a book or an epilogue. Yeah, you can probably skip it, but the experience is usually richer for doing it. The thing is, I started to notice that the music was on a 2 minute loop and that I had been waiting for 10 minutes for the game to start as I was busy getting ready for work. This wasn’t ideal. I had to put it to sleep to take it with me on my train ride into work. I accidentally hit the A button when I picked up the switch controller and the game started. Really??? It was a still shot of a ship with an anchor flashing on the bottom right of the screen. It didn’t say, “Hit a button” and it didn’t have a button letter inside the anchor… it just sat there and flashed. I thought it was loading. It did start just fine, but I was late for the train so I had to move. Thank goodness it was on the Switch, huh?? This tutorial is brutal. It lasted my entire 50-minute train ride and I still had a bit to go through before I could save. Glad for the sleep mode because, while I did enjoy what I had done up to then, I really didn’t want to go through it again. Have I really written this much about the tutorial? Yes. Yes I have. Oh, and you don’t have to go through the tutorial if you already know how to play, which is a nice option. Moving on, the tasks are set ahead of you to reduce the “fog of war” surrounding your continent, which to no one’s surprise is Europe. Well, northern Africa is there too, the Egyptian part. You are tasked with exploring the world, or sailing off the edge, to make money for the king. You also need admirals for your fleet. You also need a fleet. You need to search for hidden treasure, which means that you have to zoom in really close to the map and sweep it to find something interesting. When you do get lucky you instantly get money, and that’s something you’ll always need to forge ahead. You’ll use currency to expand your fleet, hire admirals, and more. The bigger you get, the more tasks you can assign and hopefully the more treasures you’ll find, which will line the pockets of your king and your employees. Setting up trade routes is just pointing and clicking on two ports to set them up. Sometimes you will be given new products to make when you connect the right cities to trade between them. You can send your fleet off to discover new lands as well. This is more of the interesting bits because your admirals can run into pirates, get lost, or run into Krakens. Yes. Plural. There are a lot of Krakens in the seas. I don’t know why there are so many them. I felt like there were more Krakens than pirates, but then a pirate is a choice and a Kraken is just a Kraken and they just make more Krakens. Every time. When a pirate makes a child, they don’t necessarily become pirates. So maybe the Kraken to pirate ratio is right. But what do I know? The game is presented to you in a graphic novel sort of way. Expect to see lots of still photos alongside a lot of dialogue to read. The prose can be quite funny in places and really breaks up the monotony. 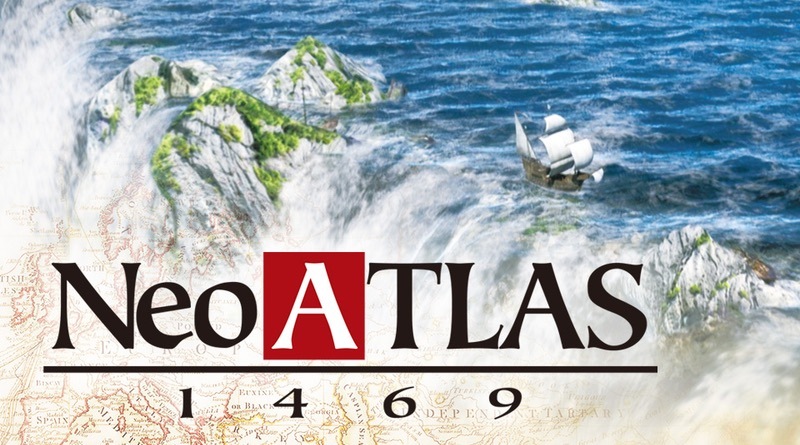 That being said, Neo Atlas 1469 won’t be for everyone. There are a lot of repetitious tasks throughout the game and honestly there were times when I became so totally uninterested in what was going on that I set my Switch down and came back to it later. I know that can happen with every game out there, but when a game just isn’t your bag, it can get very tedious and a fell a bit like a job. If you love simulation games you’ll probably dig this one. If you’re not sure, then it might be best to wait for a sale before checking this one out. Neo Atlas 1469 is a simulator that shares a lot with graphic novels. You’ll be setting up trade routes, discovering new lands, and hunting for treasure. This is such a niche genre that not everyone will find enjoyment here, but it’s worth considering for those who love this style of gameplay or for those who are new to the genre.